Is Obamacare really affordable? Not for the middle class. Obamacare is now a tale of two health insurance programs. For the 85% of enrollees with lower incomes, federal subsidies make the premiums somewhat more affordable. Those even closer to the poverty line can get additional subsidies that reduce the deductibles, which can run into the thousands of dollars. But for many middle class Americans -- a single person earning more than $47,520 or a family of four with an income of $97,200 -- the pricey premiums and deductibles mean health care coverage remains out of reach. "The middle class are getting squeezed," said Larry Levitt, senior vice president at the Kaiser Family Foundation. "They aren't getting subsidies and these deductibles are hard to afford." This schism is turning Obamacare into another government benefit program for lower- and moderate-income Americans. The typical enrollee has an income of only 165% of the federal poverty level, or $40,000 for a family of four. The real problem is that health care is very expensive, Levitt said. But most Americans don't realize the true cost because they are shielded by their employers. Some 150 million people have insurance through work, paying only about $440 a month for a family plan, while employers cover the rest, or about $1,075. For the 10.5 million enrollees on the Obamamcare exchanges, health insurance costs are more transparent. And more of the burden falls on the consumers. That is leaving an untold number of Americans opting to remain uninsured, rather than shell out thousands a year for premiums and deductibles. In 2015, 46% of uninsured adults said that they tried to get coverage but did not because it was too expensive, a Kaiser study found. The big price spikes for 2017 have some current Obamacare enrollees wondering whether they'll renew their plans next year or opt to pay the penalty of $695 per person, or 2.5% of income, whichever is larger. Take Irene Solesky of Towson, Maryland. A mortgage underwriter, Solesky and her husband earn too much to receive a subsidy. So next year, they will have to pay $1,351 a month for a CareFirst Bronze plan for themselves and their two sons. On top of that, they face a $13,100 family deductible. "It's a catastrophic policy as far as I'm concerned," said Solesky, 55, noting her Obamacare policy costs twice as much as her mortgage. "Medical insurance was meant to keep medical expenses from driving you in financial ruin, not for the medical insurance to drive you in financial ruin." 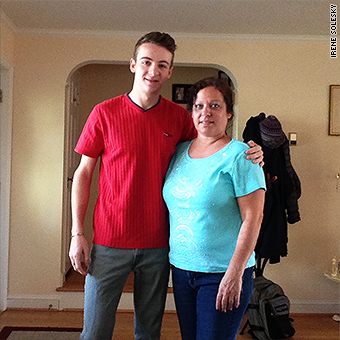 Irene Solesky, with her son Dominic, finds Obamacare to be unaffordable. Before the Obamacare exchanges opened in 2014, Solesky had an individual insurance plan that cost her $215 a month to cover herself and her two sons. The deductible was $5,000. But the carrier wouldn't cover her husband because he had high blood pressure. 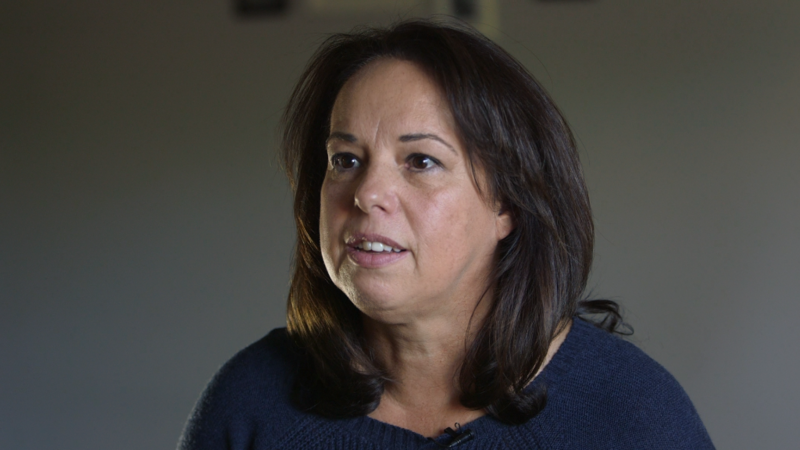 Initially, Solesky was looking forward to Obamacare because it did not allow insurers to exclude those with pre-existing conditions, like her husband. But she did not expect the prices to be so high. She's now considering dropping her plan and paying the penalty, especially since the only medical care the family received this year beyond an annual check-up was a mammogram for Solesky. While costs vary widely across states and carriers, the average national prices give some insight into just how steep Obamacare premiums and deductibles can be for the non-subsidized. 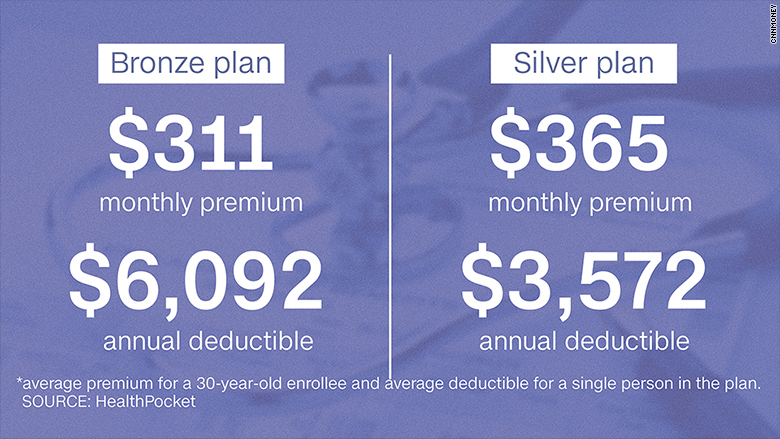 A 30-year-old will pay an average of $311 a month for the lowest-level bronze plan for 2017, while a 60-year-old will pay an average of $744, according to a review by HealthPocket, which analyzes insurance plans. Both rose 21% from this year. And the average deductible on a bronze plan will top $6,000 next year for an individual and come in at nearly $12,400 for a family. Health Department officials acknowledge that Obamacare premiums and deductibles can be pricey, especially for those who don't qualify for subsidies. "These costs are largely a symptom of the fact that medical costs in this country are extraordinarily high," said Kevin Counihan, CEO of the federal exchange, healthcare.gov. "We have an 800-lb gorilla here, which is exploding health care costs." In the short term, officials are trying to make sure enrollees know about the services they can receive that aren't subject to the deductible. These include an annual check-up, various preventative screenings and, depending on the plan, additional doctor visits and some medications. They are also working with insurers to expand the services they provide outside the deductible. Longer term, Obamacare has several provisions designed to slow the growth of health care costs, such as rewarding doctors for delivering more efficient, coordinated care of patients and penalizing hospitals with high readmission rates. For lower- and moderate-income Americans, federal subsidies take out some of the sting. They can reduce premiums to just under 10% of a family's household income ... or even lower depending on the policy one picks. Some 72% of all enrollees can find a plan for less than $75 a month. Still, many of these folks have to contend with deductibles of thousands of dollars. Those who earn less than $30,000 a year, or $48,000 for a family of four, are also eligible for so called "cost-sharing" subsidies that lower the deductibles and co-pays, as well. Some 57% of Obamacare enrollees receive these additional subsidies. A 30-year-old Houston man earning $22,000 a year could find a plan for $100 a month with a $500 deductible next year, thanks to both subsidies. But that same plan would cost $251 a month and come with a $2,400 deductible if he earned $35,000, making him ineligible for any government help. "The subsidized are insulated from market realities," said Kev Coleman, head of research and data for HealthPocket. "For the unsubsidized, how attractive are these plans going to be?" For Michael Horbal, 49, the premium subsidies allows him to select a silver plan rather than a bronze one that would mean higher out-of-pocket costs. Horbal, who is married with four children, paid about $600 a month this year for a policy that originally cost $1,200. The plan has a $4,500 deductible. 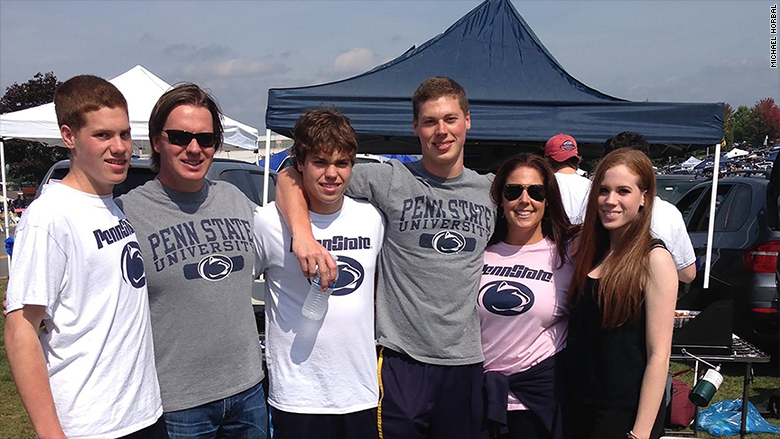 Michael Horbal, second from left, and his wife can buy a better Obamacare plan to cover themselves and their four children, thanks to federal subsidies. "Having that subsidy ... has allowed us to buy a better plan that we could not otherwise afford," said Horbal, a Newtown, Pennsylvania resident who owns LifeInsuranceAdvisors.com. "It's a huge benefit." But the reality is very different for Clare Lee, 62. The Midland, Michigan, resident finds himself skimping on care even though he has coverage through Obamacare. Since he and his wife don't qualify for subsidies, they pay $1,200 a month for a Blue Cross bronze plan that comes with a $12,000 deductible. Lee, who is in retail sales, didn't go to the doctor when he had a cough in March. He didn't want to pay the full price since he hadn't met his deductible. The cough lasted a month. "There were other times I should have gone, but all that comes out of my pocket," said Lee, who, prior to Obamacare, had a Blue Cross plan with a $532 monthly premium and $4,000 deductible. "So I see if I can just work through it."